Body structure: Amoeba appears as a colourless and transparent drop of jellywhen viewed under a microscope. Body structure: Amoeba appears as a colourless and transparent drop of jellywhen viewed under a microscope. It lacks a definite body shape because it changes its shape by producing the pseudopodia every moment. So, it is not possible to describe its definite shape, anterior or posterior ends, dorsal and ventral surfaces. 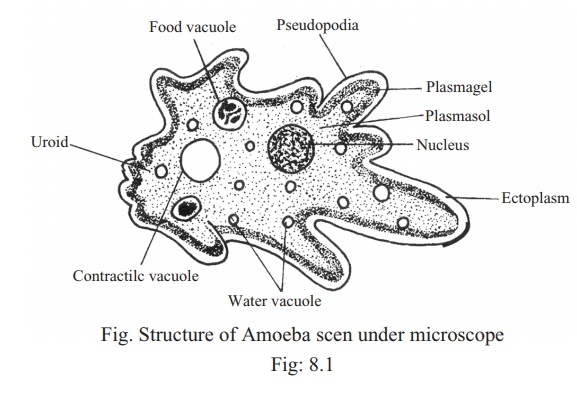 Moreover, as Amoeba's shape is changeable, its body cannot be divided into two similar parts. This condition is called ,asymmetry. In size, a full grown Amoeba generally may be from 1/20 mm to. 1 mm. The body of Amoeba can be divided into two main parts, Plasmalema and Protoplasm. A. Plasmalema or Plasma membrane: The body of Amoeba is covered withplasmalema formed by the combination of protein and lipid. This membrane is extremely thin, living, semi-permeable and elastic. 1. Plasmalema of Amoeba gives its shape. 2. It holds the various organelles inside the protoplasm. 3. The membrane being elastic it can produce pseudopodia easily. 4. By the process of diffusion, through the plasmalema it takes oxygen and water. It also discharges carbon dioxide and excretory materials through the membrane. 5. It helps the Amoeba to become attached to any solid surface. B. Protoplasm: The thick jel1y like substance surrounded by the plasmalema isthe protoplasm. It can be divided into two parts, Cytoplasm and Nucleus. 1. Cytoplasm: Without the nucleus, the rest of the protoplasm is cytoplasm. Itis divisible into two parts, such as Ectoplasm and Endoplasm. Ectoplasm: The part of cytoplasm immediately behind the plasma membrane isknown as ectoplasm. This part is thick, transparent, non-granular and contractile. 1. Ectoplasm protects the organelles inside the body. 2. It helps to maintain the shape of the body. Endoplasm: The granular portion of cytoplasm which is surrounded by theectoplasm is known as the endoplasm. This part is semi transparent and less viscous. The relatively thick outer part of endoplasm is called plasmagel and inner liquid part plasmasol. The granules of plasmagel generally always remain stable. But the granules present in plasmasol show active movement. The difference between plasmagel and plasmasol is .not consistent because one can be transformed to other. 2. It assists in various physiological functions. 3. Frequent change in the density of the plasmagel and plasmasol helps in producing pseudopodia. 2. Nucleus: At the middle of the endoplasm the translucent round body seen isthe nucleus. It cannot be clearly seen in the body of living Amoeba. There is only one nucleus in Amoeba., The nucleus is covered by the nuclear membrane made of protein and lipid. Inside there remain chromatin fibres and the nucleolus. The amount of nucleoplasm is scanty in the nucleus of Amoeba. 1. Nucleus conducts the functions of the Cell body. 2. Nucleus takes active part in reproduction. (A) Pseudopodia: Froml any part of the body of living Amoeba finger likegrowth are produced continuously. These are known as pseudopodia. Pseudopods are made of plasmalema, ectoplasm and endoplasm. These are unstable outgrowths of the body and disappear soon. The anterior part of pseudopods is round and blunt. 1. Pseudopods help in capturing the food materials. 2. They play an important role in locomotion. 3. Pseudopods indicate the anterior part of the Amoeba at the time of locomotion. (B) Vacuoles: There are several types of vacuoles in Amoeba. Presence of thevacuoles is an important characteristic of Amoeba. The nature of formation of these vacuoles is rather simple. The vacuoles help in various physiological functions. There are three types of vacuoles in Amoeba. 1. Contractile Vacuole: In the endoplasm of Amoeba some bubble likevacuoles are seen. These vacuoles are transparent and fast growing. In the body of the living Amoeba these vacuoles can continuously be contracted or expanded, so, these have been named as contractile vacuoles. a) Contractile vacuoles store the watery substance of the body. b) They-help in the removal of excess water and excretory products. c) They help in the expulsion of carbon dioxide produced during respiration. 2. Food Vacuole: In the body of Amoeba food vacuole is formed surroundingthe food material. There may be one or more of this vacuole. Size, shape and number of these depend on the size, shape and number of food materials. a) Food vacuoles store the food material. b) They help in the digestion of food. c) They have also roles in excretion of faecal materials. 3. Water vacuole: The smallest transparent, round water filled vacuole in thebody of Amoeba is the water vacuole. In number it can be one or more. Water vacuole is noncontractile. Functions: Water vacuole contains water and keeps the balance of waterconstant of the body. If an Amoeba is examined under high-powered microscope some organelles are seen as. Goigi bodies: Within the'stained body of Amoeba some structures are seenwhich looks like small tubules and vesicles. These are known as Golgi bodies. Function: Golgi bodies help in secretion and excretion of food. Mitochondria: Around the contractile vacuoles some rod or dot like structuresare seen. These are mitochondria. Function: They take part in respiration and in energy generation. Reserve food: In the endoplasm of the body of Amoeba food particles remainstored as fat and starch. When necessary these stored food materials provide nutrition to Amoeba. Crystals: Crystal particles of different shapes and sizes are found in the bodyof Amoeba. It is assumed that these crystals are simply the faecal substances produced during metabolism.